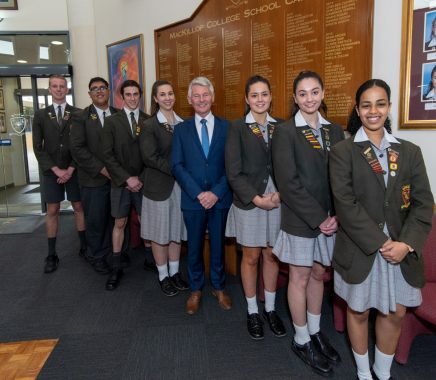 The MacKillop College School Captains are chosen as a team of six or more Year 12 students. Have a love of and loyalty to MacKillop College – its past, present and future. Demonstrate a sense of responsibility, a positive co-operative spirit and a willingness to show an unselfish service to others. Work with the Principal, Deputy Principals, Level Coordinators and staff in planning and maintaining a vision for the College and that they will work for the well-being of the total College Community. Lead the SRC meetings to develop within the group a strong sense of community through the positive interaction with representatives from all year levels throughout the school. They should be able to motivate and involve others as well as being able to delegate effectively. Have a demonstrated record of involvement in school activities and be involved in the organisation of whole school activities throughout the year. Be willing to accept challenges and carry them out. Be able to lead by the example of their own participation in school activities. Follow school rules and set an example for all other students to follow. Be able to communicate well with teachers, members of the public, other college leaders and students. Be punctual, well organised and use time effectively. Be able to effectively balance study and the demands of being College Captain.